Variations in title: Formerly known as the Guelph Public Library Cookbooks collection. 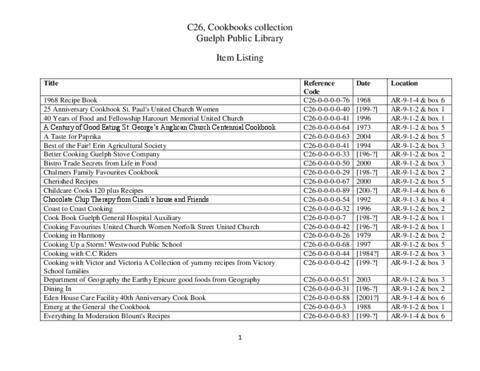 In the 2011, the archivist of the Guelph Public Library began assembling various cookbooks that were purchased by the Library. These cookbooks formed the basis of this collection. Newer donations of individual cookbooks received by the archives are accessioned into this collection. This collection consists of cookbooks collected by the Guelph Public Library archives. Some of the cookbooks include brief histories on the organizations that sponsored or created them. These records document the historical and or sociological aspects of food and nutrition in Guelph. There is no further arrangement to this collection. The file listing has been arranged alphabetically by title for ease of use. To access records in this series, consult File List C26 to narrow down your search. Order the desired boxes from the Guelph Public Library Archivist.